Thousands of miles from California, my "farm-to-table" philosophy followed me to the streets of Philadelphia. Urban life isn't far from the farm when local markets are so close at hand. A short walk in any direction and you'll find everything from small, farmers market-type stores to up-scale Whole Food-ish shopping experiences. It was Sue's Produce Market that had me feeling my California roots. Well positioned just inside the door of this diminutive little produce market were boxes of peaches and cherries -- proudly emblazoned with the land of their birth! Yep, California! And down the way, boxes of California's very own Vitamin Sunshine "C" in the form of oranges. The best of California agriculture there in the in the "City of Brotherly Love." A very good reason to love it! As if Monterey Bay weren't enough. Coupled with stunning bay views from my suite windows. Oh, no, they just had to add the bonus of breakfast in bed...or in a comfy chair....or on the balcony...OMG...how do you decide? 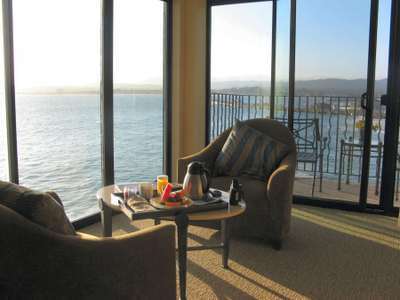 When staying along Cannery Row and Monterey Bay, the choice is easy: choose the Monterey Bay Inn or Spindrift Inn. The views are unparalleled and there's the added "little thing" of continental breakfasts served right to your door! How precious. Each day, a new in-room dining form is left on your bed. All you need do is check the food choices -- presented on a beautiful tray with fine china and linens choices include breakfast pastry, hard-boiled eggs, fresh baked breads, muffins and bagels, seasonal fruit, choice of fresh squeezed juices, cereals, and coffee or tea-- the time you want it delivered (very reasonable 7am - 10am) and hang the order outside your door before midnight. The next morning, a gentle tap on your door brings your breakfast to you. No fuss. No muss. The joy of fresh coffee and all that view. Oh, yes, the daily USA Today, too! I must be dreaming. BTW - the two inns have had this idea all along that "it's the little things" that count. Contact me if you'd like to hear the "Rest of the Story" about my recent visit to Monterey Bay. Friends, families, lovers...nothing can compare.